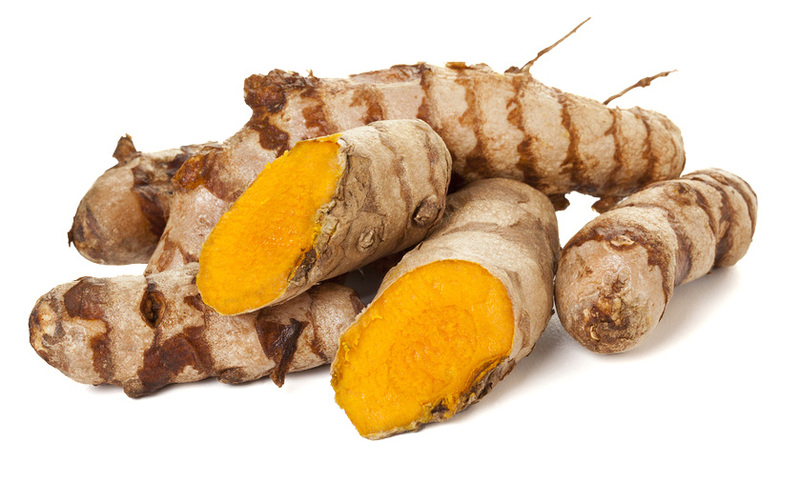 Fresh turmeric root is a fantastic ingredient, however it stains just about everything—skin, clothing, cutting boards, and even your plastic containers and food processor bowl! Of the many ways to remove stains, some are more successful than others. We’ve listed a few that we have tried from the wonder powder that is baking soda to the stain removal nuclear weapon that is bleach. Baking soda: Make a paste with baking soda and a few drops of water, apply generously around stained area. Let sit 15 minutes before scrubbing, then rinse thoroughly. Distilled vinegar or bleach solution: Combine 1/2 tablespoon bleach or distilled vinegar with 1 cup water. Soak container in solution 30 minutes, then rinse thoroughly. Gently dab or scoop off spill. Do not rub out stain with water! It will just spread the stain more. Pour on baking soda to absorb additional stain. Let sit for 15 minutes, then shake off. Soak area in vinegar solution—1 tablespoon vinegar to 1 cup water—then dab dry. Wash immediately. If bleach-safe, use bleach. Hang to dry in sun to break down more of the pigment. Mix a few tablespoons of granulated sugar with a few drops of olive oil to make a scrub. Scrub away stain, then rinse. This entry was posted in Chew On This and tagged Chew On This, turmeric by Oakley B. Bookmark the permalink.